Across the River RV Park in Soldotna Alaska offers sockeye salmon fishing on the Kenai River, rainbow trout fishing and silver salmon fishing in the fall too. Soldotna Alaska Campground located on the Kenai River with bank fishing access for Sockeye Salmon Fishing on the Kenai River. Directions – From the west side of Soldotna, turn onto Funny River Road and follow the river upstream for 12 miles to Grayling Ave, turn left and go two blocks to King Salmon Drive. Turn right and follow the road to the campground entrance. 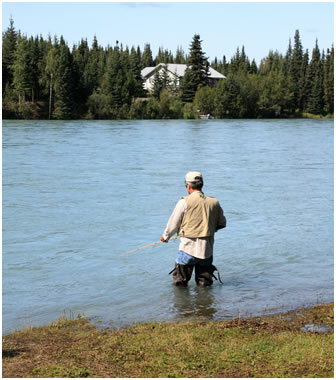 Across the River RV Park in Soldotna is a popular destination with local fishermen looking for some great access for sockeye salmon fishing on the Kenai River in June and July plus rainbow trout fishing and silver salmon fishing in the fall too. For a complete list of campgrounds and RV parks in the Soldotna area we have added a list with links to each destination at Soldotna RV Parks. Additionally there is a list of campgrounds in Alaska covering the entire state.